Explore Portland Oregon! This signature bike tour is an ideal introduction to the City of Roses. 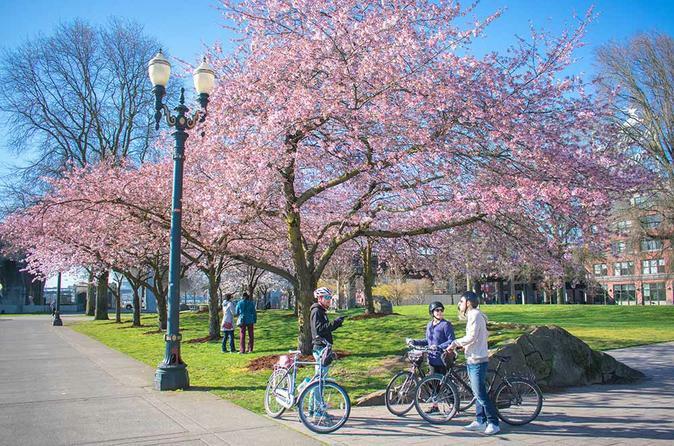 Visit historic Old Town, pedal the Waterfront Esplanade, cruise the Green Park Block corridors and explore the Pearl District with our experienced guides and comfortable rides. Meet us at our convenient downtown location and pick out bikes as we get ready to head out on the town. Rolling through the heart of China Town and in to Tom McCall Waterfront Park, our first stop is at the Japanese American Historical Plaza for a bit of history and a look at the ever changing cityscape. Continuing on, participants experience world class bike paths and scenic vistas of the Portland skyline on our way to visiting green neighborhoods and successful commerce spaces. Enjoy the smooth path through Portland’s Park Blocks and visit our newest park for a look at modern design techniques and a look in to the future of community spaces. This bike tour would not be complete without a cruise through the Pearl district – a hotspot for the incredible food, beer, and craft culture here.